Gor Mahia defeated their fierce rivals AFC Leopards 2-0 in a hotly contested match played at Nyayo Stadium on Sunday. This is a match that usually attracts massive crowd and Sunday was no different as fans of both the Green Army and Ingwe came in large numbers to cheer their respective sides. K’Ogalo came into the battle knowing anything less than three points would kill their bid to defend their crown, with AFC Leopards also aware that maximum points were all the side needed to at least make a step forward into the top eight positions. Gor Mahia, who were boosted with the return of Collins “Gattuso’ Okoth, started a brighter side of the two, threatening earlier on in the third minute as George Odhiambo was left free, but Jacques Tuyisenge failed to connect the resultant cross with the goal at his mercy. In the sixth minute, Karim Nizigiyimana was at it again, crossing the ball but Edwin Wafula cleared it. Ingwe finally had a chance of their own in the eighth minute courtesy of Paul Kiongera, who hit a long range effort that went wide. As the first half continued, it was Gor Mahia, who looked the better side, threatening regularly, but was unable to get the ball into the back of the net. At the stroke of half time, Gor Mahia won a corner that was delivered by Francis Kahata, but Tuyisenge hit the cross-bar with keeper Lucas Indeche well beaten, and the ball was put into a safe position by Wafula. 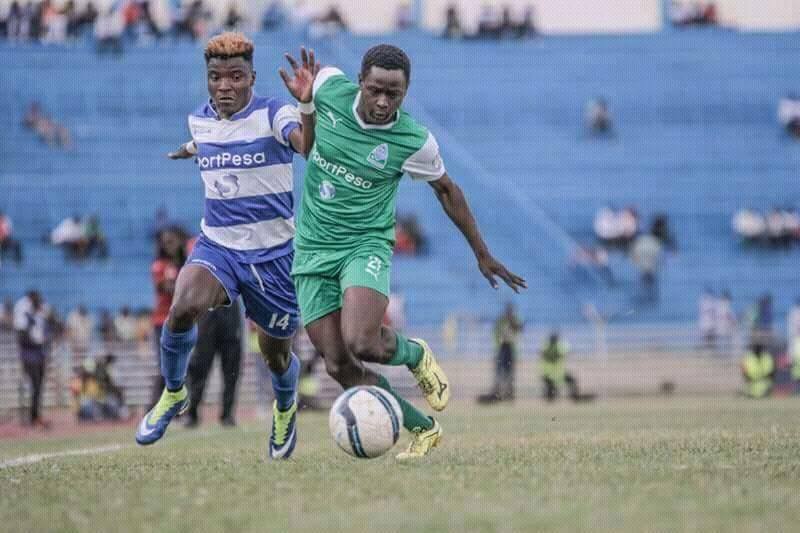 After the break, AFC Leopards came stronger trying to break a stubborn Gor Mahia defense, and in the 55th minute, Paul Kiongera did well to go past Haron Shakava but he hurriedly released a pass in search of Kepha Aswan which defender Musa Mohammed did well save. Gor Mahia continued pressing, with full backs Karim Nizigiyimana, and Eric Ouma bringing crosses that troubled Ingwe defense. However, it was Tuyisenge, who was brought down in the danger zone, and the referee had the easiest of decisions awarding Gor Mahia a penalty. Meddie Kagere rose to the occasion, sending Indeche the wrong way to give K’Ogalo a deserved lead in the 64th minute. AFC Leopards coach Ezekiel Akwana responded by bringing in Alfred Wekesa and Yusuf Suf in places of Simon Abuko and Andrew Tololwa, but it was substitute Enock Agwanda, who had replaced Collins Okoth, who finished off Ingwe in the 83rd minute. The former Sofapaka man hit the roof of the net, after Eric Ouma had floated in a wonderful cross from the right. The result puts the defending champions firmly in contention for the title, after Tusker were held to a 1-1 draw by Nairobi City Stars. AFC Leopards: Lucas Indeche (GK) (C), Edwin Wafula, Cresten Mwanzo, Eugene Ambulwa, Joshua Mawira, Bernard Ongoma, Simon Abuko, Moussa Sissoko, Andrew Tololwa, Mungai Kiongera, Kepha Aswani. Subs: Edwin Mukolwe (GK), Yakubu Ramadhan, Haroun Nyakha, Bernard Mangoli, Yusuf Suf, Alfred Wekesa, Jack Bruno. Gor Mahia: 23. Bonface Oluoch -GK, 14. Karim Nzigiyimana, 5. Musa Mohammed (Cpt), 18. Haron Shakava, 21. Eric Ouma, 6. Collins Okoth, 8. Francis Kahata, 22. Maddie Kagere, 25. George Odhiambo, 9. Jacques Tuyisenge, 2. Godfrey Walusimbi. Subs: 1. Jerim Onyango -GK, 4. Wellington Ochieng, 3. Abouba Sibomana, 11. Amos Nondi, 29. Innocent Wafula, 27. Jacob Keli, 24. Enock Agwanda. The kpl fight headed to the wire, I promise those hypocrites who going by their comments here have always written off gor mahia for the title defence. Please as you comment your nonsense whenever gor draws a match or loses(rarely), consider that you are a fan and you know football has only three outcomes, draw, win or lose and gor being a football team is not excepted. So what do you need to do with your comments?? Encourage the team and cheer them relentlessly whenever they play. Go to the stadium if you are able and don’t show AFC cowardice act of ” sack the coach”. Be patient with the coach coz the team plays perfectly well only lady lack has on several occasions refused to smile at us this season. the notorious one @musyimo, tell them, some plastic fans with faint heart. @sylvaonyi, where did you get the right to lecture other people on what they need to post? You only enjoy that right in your household!!! I have said before that my comments are based on individual games and I was among the first to congratulate the team yesterday. Maybe you were too blinded by sycophancy to read it. Keep it here for the next draw and how stinging my criticism will be!! We thank The Lord for this deserved win. Efusi were there for the taking and Gor Mahia did not disappoint. It’s now an open title race and Sony might just open it further if they can hold Tusker or even beat them when Tusker travels to Awendo in the coming week. May God bless us even more when we play our remaining 3 matches. Thumbs up Sylvaonyi n Le Pastre. Like the never say die attitude. This thing ain’t over till its over. Congrats to the boys. Guys let us keep calm. 3 matches to go and tusker can possibly drop points. Against bandari, their game was almost headed for a barren draw until they introduced owusu who score a header from a corner kick. That goal if you watched was by a whisker. Relegation bound city stars held them, and we all know muhoroni didn’t give them a heavy weight fight allowing them cheap goals enough to suggest muhoroni might have gotten compromised going into the match. Next is Sony. Who knows???!!! Only God. But as far as I’m concerned subdueing Sony at the Awendo green stadium is not an easy task guys and I say this coz I hail from awendo. Next for us is mathare, we beat them in the first leg when they were enjoying a rich form and were even top of the table contenders. We have always beaten them season in season out, remember 2015 during abondo and olunga’s era. Now that we are buoyed by the derby win, who cheats you that mathare might ho past gor so easily next weekend?? After that, muhoroni. For will go with a top 8 final revenge mentality and I tell you muhoroni will not beat gor a second time, save for a rich form that gor always enjoy against them. Last is tusker for us and this game might find the points gap is only a point or two then who knows?? Only God knows. I tell you one team might lough all the way to the trophy as another cry their tears but I tip gor to win and defend the title. Even if gor doesn’t win, after crying, we will wipe our tears and pat our backs again for having given tusker the most tight race even though they win it. Friends it is not over till it’s over so keep away with your cowardice comments of ooh clueless coach, clueless blabla….. Kudos to the team for the win.as 4 @slyvaonyi u cannot gag the GM fans,the days of praising the king while he is naked are long gone.I strongly believe the displeasure expressed by fans when the team is doing badly is largely what drives the team/coach to improve.note de matteo Aston Villa coach was recently sacked having drawn all matches no loss,why becomes guys want to win,so when ze is critisised its nothing personal.we all want the best for the team.so wewe na hiyo nonsensemeter yako jiwekee. If you’ve been watching all the matches I think only luck is not with us. When Olunga joined last season it took him close to six game’s to score. We have the best strikers. We will win this league. If you haven’t the guts to believe in Kogallo then just look for another club to support. Stupid comments from new comers to this site. You have no right to tell your fellow bloggers that they can look for another team to support. Gor does not belong to you and please note that we are more Gor Mahia than yourself. Such retarded comments and mentalities are meant for the yesteryears. .
All these comments are timely good.some hypocrites over here should know people.They fasted and meditated for AFC to win only for them to be frustrated by ze Maria’s unpredictable approach.May I take this opportunity to apologise to them on behalf of ze maria.That it’s not in ze Maria’s interest to see their team (AFC)being relegated.He was innocently looking for three points.so kindly don’t start insulting the coach but feel free to “fire” your own Akwana as you like writing over here.people post here four to six times when gor loose or draw.but when we win,they disappear in the thin air.These “fans” are a liability to this great club.They insult our players in training and TB. -They don’t pay entry fee. -They cost the club 3-vital points. .we must find ofgetting rid of these good for nothing fans. Tell them ,if they could avoid hooliganism may be at this point our dear Gor would be in the lead or just a point behind Tusker,Man U are a big team ,they have lost many matches yet no pitch invasions have been witnessed. The next match against Mathare Will truly measure the character and strength of Kogallo. This will determine the the cause of the future, because Kimanzi is equally a good tactician.Ze Maria has to pull up his socks to upstage him. How we began the league is irrelevant this time but how we wind up is quite important. Ze Maria has the means, quality,ways of delivery only if he plays his cards right. Go wuod Ogallo , now it’s the Mahia part that is in charge. We have, a coach, good players but Gor only is not ipto task, Mahia, the mystic one, take control now. There are 3 types of characters in any club. The fans – they criticize and praise the team in equal measure. The cricitics – they only criticize everything the team does and lastly the fanatics – they only praise everything the team does. So as you can see both criticism and praise are good as the not only build up and toughen the team’s character but also pampers them a little. I watch mamelodi subdowns win the CAF champions league last night and the coach’s reason for success- he toughned the team from inside out i.e he first build their character to be champions. So I still maintain , this trophy is for tusker to loose! It is interesting that almost 24 hours later, we only have 9 posts. If Gor would have settled for a draw or lose, I am sure we would be doing close to 50 posts by now, full of insults, name calling and all sorts of things. Gor Mahia is playing very attractive football. They are yet to perfect it. It is work in progress and I can assure the prophets of doom in this blog that, come next season, Kogallo will not be a joking subject. Ze Maria is the man to get Gor where it used to be. Attractive football. @Kosero, I was among the first to congratulate the team for it’s perfomance. This post was long in coming so I posted in the previous thread so you can look that up if you have the time. It is important for you to note that I only criticize when I feel there is need, I applaud when there is success. My training only allows me to praise what is praiseworthy so don’t expect me to come here and sing to the rooftops how Gor is playing good football when we have lost to the Muhoronis and Nzoias of this world. Finally so as to put this name calling to rest I have always said that EVEN THOUGH AM NOT A COACH, i have never appreciated Ze Maria as Gor Mahia coach and never will. I respect his achievements as a player(in the Olympics) and will always respect the EC’s decision t keep him as Gor Mahia coach but wont shed tears to see the back of him. The problem with some of us here is that we are not honest,it doesn’t mean that if you criticize the team performance you don’t like the team no the problem was the bar that was set by FN,so if we get anything below that we have a right to question,the only problem me as a person i have with ZE is the way he makes his sub and even how he changes his pattern of play but we should not abuse people just because they hold different opinion,all of us has this club at heart but we both have different opinion.So my people lets sober up. I said before let’s add quality foreign and local players and Ze will match us head to head with akina M Sundowns.He came with a vision and though not fully implemented you can see result in the likes of Nondi,Ouma and Berry.If you watch harambee you will see Gor players implement Ze’s philosophy. Look at how the Musa Mohammed under Ze is better at national level than previously. I wonder whether this coach is faithful to his employer. He is competing in the same league yet fights for Brewkenge to clinch the trophy. Wonders! lets go support sony to beat tusker. Guys, realistic chance here. I have always insisted that tusker’s kind of football is far much below that of gor . The only problem is this “lady luck” who refused to lough at us even in games where we do marvellously well to create even more than ten chances. Now I promise you that tusker will drop points. Why? Let’s begin With their match against ushuru… ushuru gave them a run for their money and slowed them only for muhoroni to gift them with free goals. Next was their muhoroni match. I’m sure, for those who know muho, that had they given their all at afraha, they would have held tusker further more but because they intentionally wanted to hand tusker the title the likes of shikalo allowed them goals they did not much fight for, enough for one to suspect muhoroni had got compromised coming into the match. Now bandari, oooh man!! that was a hard one for tusker and the coastal boys almost held them to a barren draw had it not been for the late substitute, Stephen Ousu who scored a header from a corner kick. Mind you, for those who watched Ousu’s goal was by a whisker. City stars just proved to us further that tusker can be frustrated if you don’t care which team wins the title. Next for them is Sony sugar. The millers are not a play toy, guys especially at their backyard in Awendo. It might not be easy for tusker to walk away with the whole 3 points from the Awendo green stadium unless Sony also, like muho, have decided to care who among the top two wins the title. Then who tells you that a wounded leopards with Stewart Hall in charge are ready to disappoint??!! Only God knows. Getting to our game against them, oooh men!!! the gap may have gotten slimmer, say a point or two separating and this will be sweetness of a competitive league some of our friends here have always called for. It will be a fight of titans and if we lose, we will only cry like we did in 2012 at city stadium without pelting anybody with objects the congratulate tusker but we also will pat our backs for having given tusker a teal competition not like 2015 where we competed in our own league. If on the other hand we win, oooh the nay sayers…I pitty you that day. It will be the sweetest celebration ever!!!! Hata kama wewe ni wuowi majaber kabisa nade to inindo gi dhako pilepile to nyathi okwanee.Halafu wuowi marach kachieth nindo gi chiegi only 2 weeks to oyudo nyathi. thooo, berrni no sikgo. Still on real chance!!! Guys, going by the way gor plays their football, I say the title is gor’s to lose. Yes, begin with our match against relegation bound sofapaka. Gor gave their all, dictated the whole 90 minutes, created chance after chance against a defence minded lads but only luck to complete even on chance into the net and remember almost all teams in the league raises the standards when playing gor aka kpl giants(reasons self explanatory) and also rem. we were playing sofa at a time of their late resurrection. Next was our match against stima men. We gave our all and earn two on target chances and only a last minute slip cost us a deserved win. Remember western stima is not a joke and are top 3 contenders. Let’s skip mashemeji derby first and preview these matches. Next for us is mathare. Who knows mathare better?? we have over since time immemorial dominated our fixtures against this britam/betway sponsored side. We beat them in the first leg, we have always beaten them whether they are on or off form. Remember the baptism of fire they received last season first leg( Ali Abondo $ Mike Olunga). 2nd leg we left for cecafa after silencing them and keeping unbeaten tag intact. Then come the muhoroni match.. I tell you it only takes a back line slip up for muho to beat gor. Top 8 finals they were completely out played and outclassed. The problem for gor was this “lady luck”. Seems she somehow hates gor this season. We failed to convert the numerous chances and as if to go to penalties on nil nil final score, shakava made an error to their advantage. Now I ask this. Who cheats you that muhoroni will repeat same feat??!! Ng’ owuuuu….!!!! Last one, oooh man, tusker. I tell you what if gor slims the gap to one or two points, the we are in for the war on the bye bye day for kpl and who wins?? Only God knows but I tip gor to win. Kogallo pod nyalo kawo gini record 4th time in a row. @sylvonyi you are opptiimisticand this is good.there was a time i was suffering from ulcer cause of the draws and @musyoma made me to see the reality of football. it is there to be enjoyed not to die for.now you hav analysed the game positively and it giv me hope.but am also prepared that we might not win the ligue becos this season we playgood footbol and wait for lady luck to smile lets pray she smile on us and not brewkenge. I think Sony should charge cheaper rates so that Awendo stadium is full to capacity with chearing Kogalo fans and Sony fans during their Tusker match. If the fans chear throughout the game tusker will put under pressure to make mistakes.